Here, six beers to pair with Asian dishes. At Namu Gaji in San Francisco, chef Dennis Lee loves the custom beer that Dave McLean of Magnolia Gastropub & Brewery makes for him using a toasted-rice base. “It’s fresh, light and clear,” Lee says. “It has a nice nose to it—but it’s not overly hoppy or too assertive. It’s just an awesome, easy-drinking beer that pairs well with all Asian food.” Here, six more beers to pair with Asian dishes. 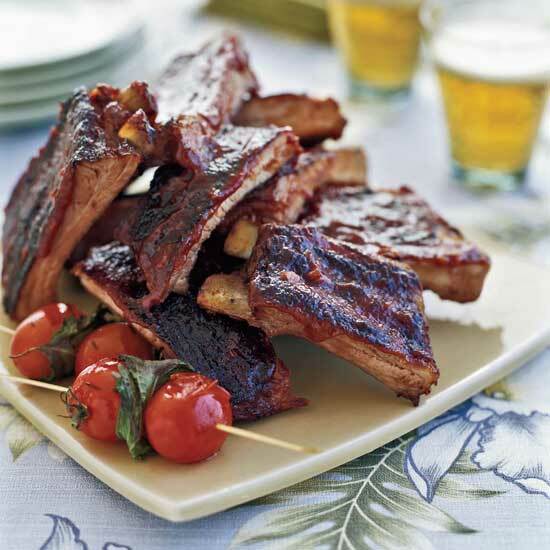 Southern Tier IPA: This hoppy, floral beer is terrific with smoky, meaty dishes like these Chinese-style ribs. Rochefort 10: A rich Trappist ale is terrific with nutty fried rice. Kona Brewing Co. Longboard Island Lager: The crispness of a lager cuts through the richness of fried dishes like this chicken katsu. Saison Dupont: This tangy Belgian farmhouse ale is delicious with the dark leafy greens in this spinach egg drop soup. Great Lakes Brewing Company Dortmunder Gold Lager: Spicy foods made with ingredients like Sriracha—such as these wings—are perfect with crisp lager. Brouwerij Bosteels Tripel Karmeliet: Spicy dishes such as this Thai ceviche are incredible with a frothy tripel.